Triathlete’s Edge contains much more than training programs. Complete assessment tools allow you to evaluate mobility, posture, gait, strength, and flexibility to make improvements through event-specific exercise drills. Swim instruction covers stroke improvement and hand entry techniques and offers tips on mass starts and exits. You’ll improve your position on the bike, perfect your posture, and study cadence and gearing on the bike. The running section will sharpen your efficiency with drills for arm movement, foot strike, and running stride. Evans reveals the professional training secrets that have defined him as the triathlon training authority. Mark Allen, Karen Smyers, Mike Pigg, and Sue Latshaw are just a few of the legendary triathletes who have benefited from Evans’ mentoring. 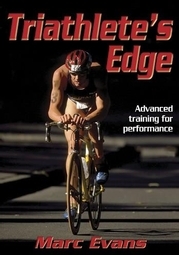 Now you can incorporate his knowledge in your own training program to give yourself the triathlete’s edge!